Do you expect more protests with the upcoming elections? Ashin Sopaka: Do you want to join? (laughs) it is possible. I can’t say for sure but it is possible. I heard just yesterday that NLD is organizing. Because of the new election law they can not register as a party. Most of their members are in prison or have been in prison. According to the new law prisoners or ex-prisoners can not be members of a party. Aung San Suu Kyi her self is under house arrest, has faced trials. So it is very difficult for them to register. They reject the constitution but if they want to register as a party they would automatically accept it. The party, their movement is now standing with the back against the wall, there is now way to move anymore. So they have to do something for this reason it is possible. This time it is very important for all to coorporate, students, monks, even soldiers and all people in the country and around the world. Then we can see the change. I believe in non violence. Non violence is our background, also Daw Aung San Suu Kyi believes in non violence like many other people around the world. With this power we have to continue. 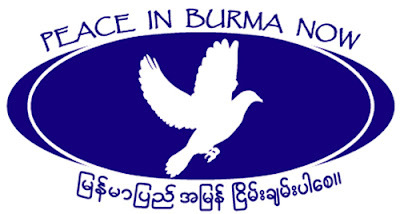 Inside Burma there are many people who would like to join us, so with this power we can do. Of cause we hope that international organizations such as UN will take care of us. They always say: “We are closely monitoring” but they are in New York. They are just talking very nicely. What does this mean “closely monitoring”? What are they doing? 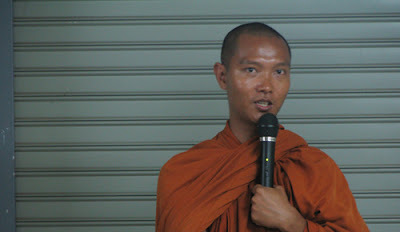 In Burma the regime is shooting the monks on the street, people are dying. But they are only saying “we are closely monitoring”. In the past Burma was closed up. I remember whenever I went there you could not see any international television, only Burmese government radio and TV stations. How is this situation now? What has changed with the satellite TV and through Internet. Because this kind of international networks makes it very difficult for the government to keep people misinformed, what their policy used to be. Ashin Sopaka: In this high-tech age they can not control everything. DVB for example is broadcasting via satellite. So many people, I heard are watching their program. The DVB is now broadcasting 24 hours. They repeat the program sometimes for one or two hours. Many people record it, copy it and spread it. The majority of Burmese people still rely on radios. That’s why you saw the propaganda in the film. They know that many are listening to BBC, VIA and Radio Free Asia. They are broadcasting every day in the morning and in the afternoon. I my self learned a lot from BBC and VIA. Since I was 14 years old I was automatically listening. Because my teacher was listening to it every evening and I had to massage him. I learned a lot and got much information. Then there is the Internet. Even though the regime has slowed down the speed and extended the controls. It is impossible to control the whole Internet. These days there are so many Blogs. The young people are also very smart, they copy the information and then they send it via email. I get such emails almost every day. That’s why it is impossible for them to block. The information technology is like a big flowing see, they can not stop it. We have to teach the young people how to use this technology. It gives us big power. We want to overcome the violence through a non violent way and for this non violent way it is very important to use the new technologies. What do you think will result from the elections this year. Are you hopeful or are you skeptical? Ashin Sopaka: I was asked the same question the day before yesterday. I said, I don’t call this an election. I call it a football game with only one team playing. According to the new law there are many restrictions. Party members must not be in jail, they must not have been in prison, they must not be facing a trial and so on. Many restrictions plus, if a party wishes to register they must accept the 2008 constitution, which is not a democratically constitution, written by the representatives of the people. So if a party registers for the election they automatically give their acceptance to this constitution. In this constitution is for example written that it is at any time possible for the military to clench power. We don’t want any more military government in Burma. The military has been in power for too long, since 1962, for more than 40 years now. It is a very difficult situation now for the parties. If they register, they have to accept this constitution, if they do not register they have to face even more repression than until now. So very difficult. We wish to see both, the government and the opposition groups talk together, find a solution and play in the election as two teams together. Not only one team, that is a joke. That’s how I see it, how I understand it. How do you think the general public, the overall people feels about the election. Do you think they feel like, lets give it a chance, or do you think they feel also that this is a one team play? Ashin Sopaka: Mostly the people don’t believe in this election. They know why this election is happening. It is happening because of the 2007 Saffron Revolution. They had to set up a date, because otherwise the uprising would have continued. So they declared that there would be an election. It is a part of the seven steps on the “road map to democracy”. This road map started in 2003 because of the Depayin massacre. On 30 May of 2003 Daw Aung San Suu Kyi and her party members were attacked. Between 70 and 100 people died. Because of the high international pressure at that time the former prime minister announced these seven steps and the international pressure stopped. This election is only the fifth step, there will be two more. We don’t know when we will be finished, how long it will take no body knows. There is no guaranty that they will hand over power to the winning party. That’s why many people don’t trust this election. The people believe we need to make the next protest. This is the way because we can not relay on the international organizations such as UN or EU. The EU countries have commonly criticized the regime and did sanctions but individually countries like France and Germany are silently still working together with the regime. Even some British companies are still working silently together with the regime. Mostly, the governments around the world are concentrating on business, not justice. So if we compare justice and business on a scale, the business side will be more powerful. The business side is very high on the scale, justice is very low and week. I think somehow they can help like “closely monitoring” but if we really want change we have to do it by our self. We have to tell the people and have to prepare systematically the next steps. What role do you want the UN to play? Ashin Sopaka: I would like the UN to say “stop killing in Burma!”. I wish that the UN would practice democracy, because they don’t practice democracy now. They always talk about democracy but in the Security Counsel there are five countries. And two countries like Russia and China are one group. The other three counties UK, US and France are one group. These two groups can not come together. In their hands is the veto power. So if fourteen counties say yes, one of these five counties can because of this veto power say no and decide the question. The one can control the outcome. In this case the veto power is a kind of dictator ship. It doesn’t work. It is the reason why they can not stop the violence around the world. If they believe in democracy they need to practice democracy. It is very difficult because China and Russia are closely working with the Burmese regime. The Burmese regime can always be sure that China and Russia will veto every decision, what ever may be discussed at the table of the Security Counsel concerning Burma. In this situation it is very difficult to expect something from the Security Counsel, the highest power of the UN. So the question is, do they wish to practice democracy or not? That’s why I say don’t relay on UN, they will never do anything. They themselves are fighting. Better have no expectations. So I have two answers to this question: start practicing democracy and stop the violence in Burma. And we don’t need so many statements from the UN. So many long statements without actions. They spend a lot of money for envoys going to Burma but there is no action.